OK, I just have to say it, I love Florida! There, I got it out of my system. 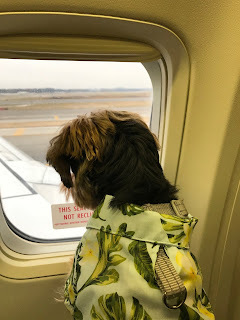 Chris and I and Finnegan departed the snow-covered and cold Baltimore area yesterday for Florida. Yes, we are getting out of the region just before the next big storm. Finnegan was the hit of the day with so many people enjoying his antics as he was waiting to fly wearing his Aloha shirt. He was an extremely good dog in the airport and on the plane. We were a bit concerned about lines at the airport and arrived earlier than usual, but there were no lines because we took an afternoon flight. Since we made it through the check-in process so smoothly, we were able to spend some time at my favorite airport wine bar, Vino Volo. Nothing better than relaxing once on the other side of security with a glass of wine and a cheese plate. 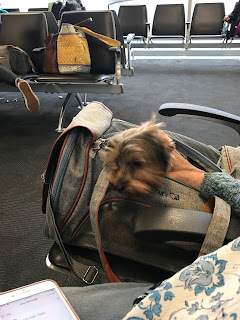 Perhaps the most impressive thing was that Vino Volo asked us if we wished to make a donation which would got to provide meals to the TSA and other airport federal workers who were not getting paid. We readily agreed. Even though our flight was delayed about 40 minutes, it was a good travel day. And I am in Florida. I walked Finnegan this morning without a coat! It was 70 degrees and felt fantastic. Good morning from Florida! Yes, it is raining, but it is a warm rain!